Neither of these figures are adjusted for inflation which has been running in high single digits in India (about 9%) and double digits in Pakistan (about 14%). Economic Survey of Pakistan 2010-11 puts the nation's population at 177 million and nominal gdp at $222 billion. In terms of purchase power parity with the PPP correction factor of 2.5, it works out to $555 billion PPP GDP. Looking at the increase in nominal GDP alone can be quite misleading in judging the health of any economy. Other indicators, such as real GDP growth and investments, show that the state of Pakistan's economy is very poor. The nation's GDP grew only 2.4% in real terms in 2010-2011. Domestic investment dropped to a 40-year low of 13.4% of GDP, and foreign direct investment (FDI) declined by 29 percent to $1.232 billion during July-April 2010-11 from $1.725 million in the same period a year earlier. I am a lecturer from Hyderabad, India. I wanted to share these thoughts with you about your older posts. Indians are as much in denial about rampant poverty as majority of Pakistanis about terrorism. If you don't like the comparison and just in case if you want to argue that Pakistan is not at all responsible for any terrorism inside or outside it then in order that the point I want to make should not be missed I would speak only about India without comparing. For majority of Indian public (excepting for a very tiny minority) the poor does not exist. The poverty does not exist. Even if they acknowledge that it is there, for them this is but natural. All that they would see is booming IT industry, growing economy, very fast growth of wealth, more cars and cell phones, IITs and IIMs etc. For these majority (and also to many in the world unfortunately these days) as far as India is concerned, it is exactly opposite of what you wrote about Pakistan '5% of bad is heard 95% of time'(In 2007 when I was in UK when I read William Dalrymple's article on Pakistan and India then I realized all perceptions about Pakistan are dead wrong and me, like everybody else, was caught in the RHETORIC that India is developing and Pakistan is backward. I appreciate that you are bringing truth to the notice of all in a sensible manner). In the case of India '20% of middleclass and affluent class's story is heard 99% of the time’. For those who repeatedly take pride in Goldmansachs report that by 2050 India would be 3rd largest economy and blah blah..., any mentioning of this crippling poverty is a major irritant. Like all super patriots they would like to hear only the success story on this side and failure story on the other side of border and so the opposite in any area is an impossible event for them. And they would never like to be told by any person belonging to neutral developed country, let alone a citizen of hostile country like Pakistan. You have done extraordinarily diligent work in identifying major failures of India and quoting them from all the neutral sources of world and bringing evidence from research data of reputed international organizations. I hope you are not celebrating India’s utter failures in tackling various issues like poverty comparable to that of sub-Saharan Africa etc. I hope you are quoting these indices only to prove the arrogant Indians who gloat about their country’s economic power, that 25 crores of people are below poverty line. SIRJI, you are forgetting one thing, that Pakistans GDP per capita has been calculated according to current prices and Indias according to base price!! Vishesh: "you are forgetting one thing, that Pakistans GDP per capita has been calculated according to current prices and Indias according to base price!!" I'm afraid you are wrong. Both India and Pakistan figures I have used are based on current prices. NEW DELHI: Per capita income of Indians grew by 17.9 per cent to Rs 54,835 in 2010-11 from Rs 46,492 in the year-ago period, according to the revised data released by the government today. The new per capita income figure estimates on current market prices is over Rs 8,000 more than the previous estimate of Rs 46,492 calculated by the Central Statistical Organisation. Per capita income means earnings of each Indian if the national income is evenly divided among the country's population. However, the increase in per capita income was only about 6.5 per cent in 2010-11 if it is calculated on the prices of 2004-05 prices, which is a better way of comparison and broadly factors inflation. Vishesh: "and by the way, inflation isn't at 14%, it is at 18%"
The relevant figure here is the consumer price index. 2011. The cumulative increase in July-April 2010- 11 is 14.1 percent as against 11.5 percent in the comparative period of last year. Riaz jee WB states that Indian per capita income is now 1.5 times that of Pakistan.nominal current prices. Please see what is happening in Balochistan,Karachi,NWFP etc etc.You think Pakistan and India are still equal!? Anon: "WB states that Indian per capita income is now 1.5 times that of Pakistan.nominal current prices"
There are a lot of different figures and forecasts floating around different websites and publications that significantly overstate India's GDP and understate Pakistan's. The figures I have provided here were released in May 2011 by India and in July 2011 by Pakistan. This is the only apples-to-apples comparison that is valid. The rest is irrelevant. Economic Survey of Pakistan 2010-11 puts the nation's population at 177 million and nominal gdp at $222 billion or $1254 per person. And Economic Survey of India 2010-2011 says India's population is 1.2 billion and puts nominal GDP at $1.46 trillion or $1218 per person. India's GDP is 1.72 trillion for 2011. Anon: "India's GDP is 1.72 trillion for 2011." I just located a document by Economic Survey of India which puts India's GDP at INR 78.78 trillion which is about $1.75 trillion or per capita gdp of $1458 at INR 45 to a US dollar. RH: "The relevant figure here is the consumer price index"
The CPI is generally useful for fine-tuning monetary policy. When discussing Real GDP versus Nominal GDP, the relevant figure is the "GDP Deflator" and not the CPI. The size of the country's gross domestic product (GDP) grew to Rs 100 lakh crore in 2012-13, about 11.7 per cent higher than the Rs 89 lakh crore a year before. 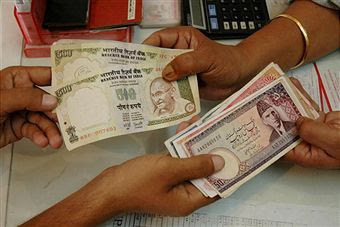 However, it contracted in dollar terms due to the rupee's depreciation. GDP at market prices (including indirect taxes) had grown 15.1 per cent in 2011-12. The GDP size, at Rs 1,00,20,620 crore in 2012-13, is only just short of the advance estimate of Rs 10,028,118 crore issued in February this year by the Central Statistics Office. In dollar terms, the economy's size fell to $1.84 trillion in 2012-13 against $1.87 trillion the previous financial year. It was so because the rupee depreciated to 54.3 against the dollar on an average in 2012-13, against 47.8 in 2011-12. According to recent estimates of the Organisation for Economic Co-operation and Development, India's economy has probably surpassed Japan for the third highest slot in world GDP, in terms of purchasing power parity (PPP) at 2005 prices. Both economies had seven per cent share in world output in 2011. However, OECD projected that in 2012 or a year after, India would replace Japan as the third largest economy. Also, India's economy might grow larger than the euro area in about 20 years. However, in current prices, India's economic size might have shrunk a bit due to fall in the rupee value against the greenback. The OECD estimated that on PPP at current prices, India's share in world GDP was six per cent in 2010 and Japan's was seven per cent. Pakistan's annual GDP rose to $252 billion (184.35 million pop times $1368 per capita) in fiscal 2012-13, according to Economic Survey of Pakistan 2012-13 estimates based on 9 months data.